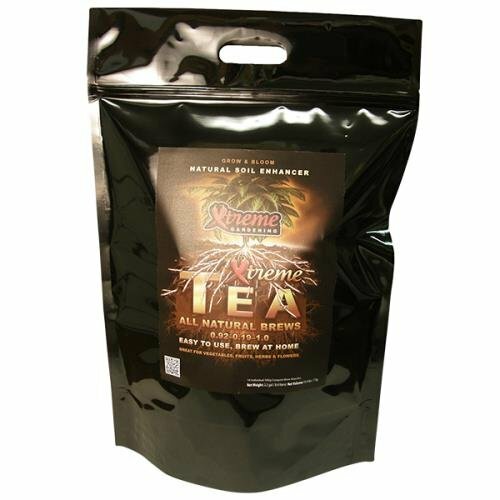 Xtreme Tea Brews are a blend of the highest-quality organic matter teaming with active soil microbes, such as bacteria and symbiotic fungi. The treasure trove of beneficial organisms in Tea Brews are poured around the base of your plant, where they begin rapidly breaking down nutrients into plant available forms. With more nutrients and minerals available, your plants reach new peak rates of growth. The living microbes help shield plants from disease and stress. Tea Brews are a beneficial additive and may be used with any nutrient line. 90 gram tea brew packs make 3 gallons of brew. The 500 gram tea brew packs make 25 gallons of brew. If you have any questions about this product by Xtreme Gardening, contact us by completing and submitting the form below. If you are looking for a specif part number, please include it with your message.